Our journey to a new Red Thread Boston workspace. Red Thread Boston moves to 101 Seaport: The story of our journey. As of January 2016, our Boston based employees found themselves in fantastic new workspace at 101 Seaport Boulevard – with gorgeous 6th floor views of the water. But of course as anyone who as experienced an office move knows, it is a journey. Lots of hard work and big decisions to be made. Normally it’s our clients who are facing these realities. So when we have to go through it, it becomes a very valuable experience, one that gives us insight and perspective into the whole process. Here’s the story of our Red Thread Boston move experience. With our lease expiring towards the end of 2015, the Red Thread and Steelcase leadership team had to take a hard look at real estate options. For 10 years, we occupied a 30,000 square foot space in the heart of the Seaport district. Yet, with better technology and changing work styles, the workforce became more distributed and the office was often empty. Over the years, these changes also dramatically reduced the need for personal storage. To complicate matters, the area was booming – with cost per square foot almost triple from a decade ago. The issue was clear. How could we optimize our footprint, create a vibrant community for our people, inspire our customers and retain a significant space in one of the hottest districts in Boston? Throughout the search, design and build-out of the new space, Red Thread employees were kept up to date on the progress through weekly communication and presentations. After careful consideration, a 13,000 square foot space was leased at 101 Seaport – less than half the size of the old space. With floor to ceiling windows and a unique L shaped footprint, the space provided an opportunity to design a workplace that met the needs of all constituents. During the design phase, teams were interviewed further about their work needs, including storage, collaboration and workspace preferences. 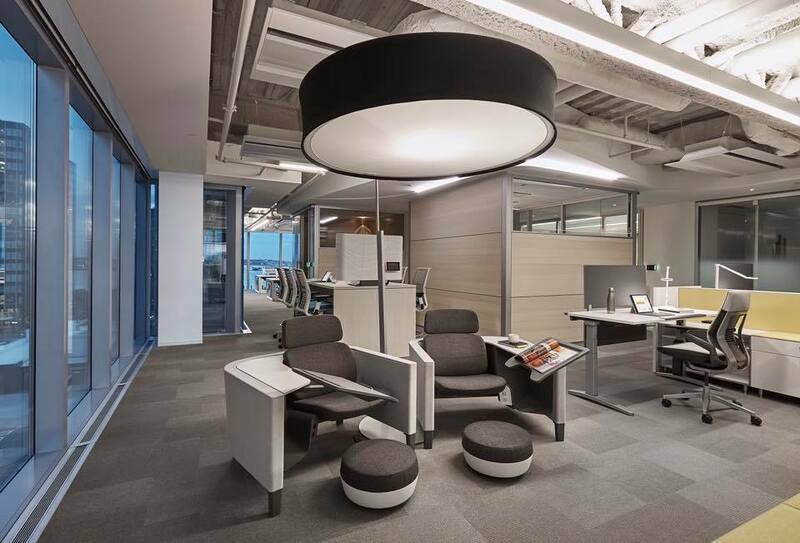 The goal of the design team was to create an ecosystem of spaces that provide a range of options for focus work as well as settings for both open and both closed collaboration. Transitioning one department to another Red Thread location, and with the understanding that not everyone is in the office every day, our new space easily accommodates 60 of the 80 employees who consider this location to be their home base. What the space doesn’t have are a lot of resident workstations. In fact, 90% of employees based out of Boston do not have their own desks. Instead, people are encouraged to move around the space throughout their day, choosing the right kind of space for the task at hand. Open plan destinations include desk and standing height benching, café tables and booths as well as some height adjustable work surfaces. Spaces for focus, respite, collaboration and learning are created using glass demountable walls – providing acoustical privacy, visibility and integrated technology. 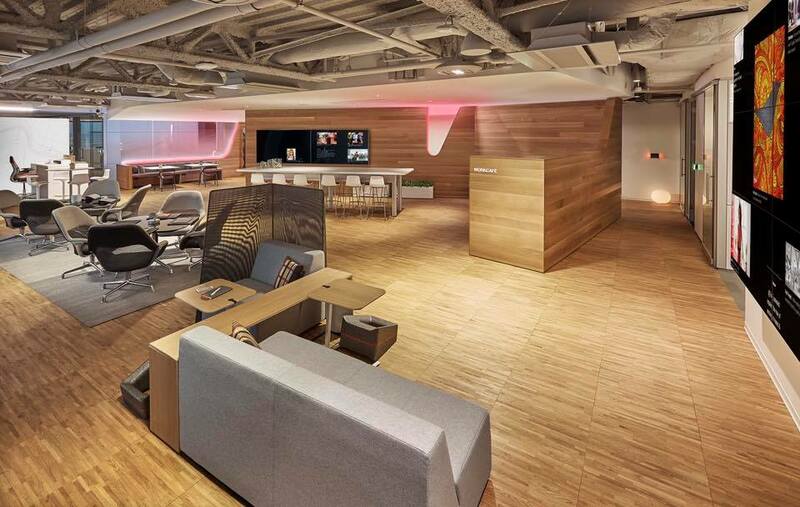 The space also features state-of-the-art audio visual technology, including a 9 display video wall, media:scape settings, Microsoft Surface Hubs and flat screen displays, integrating video collaboration throughout. Move in occurred in early January with employees being welcomed to the space with a gift and a protocol guide for the new way they would be working. In addition, all “nomadic” employees have a locker where they can store their personal items. 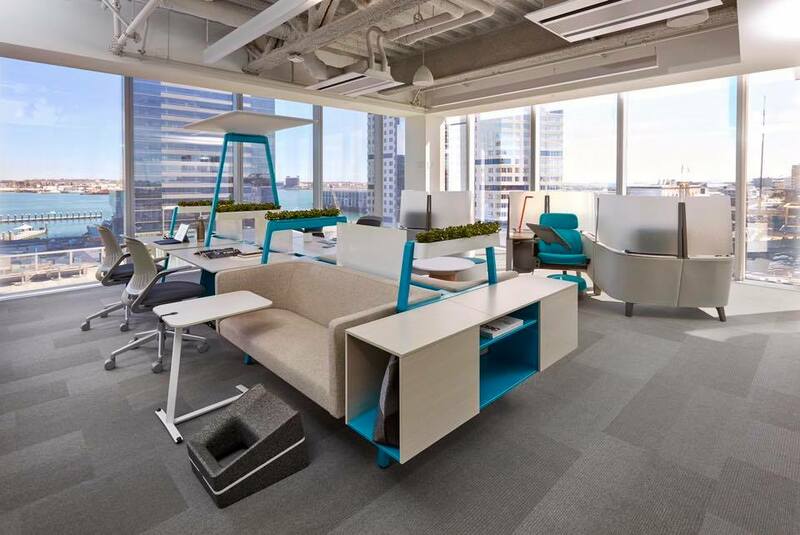 Stand, sit, lounge or walk as you work, the options abound, the goal is to encourage people to move throughout their day, intersect with colleagues both formally and informally, and create a space that is inviting yet functional. All spaces are open on a first come first serve basis (private rooms can be scheduled) giving everyone the chance to try a space and understand its benefits. Embracing organizational change begins at the top and our leadership team has fully adopted to this new way of life by taking advantage of working throughout the space ̶ in the work café, at a shared benching space or in a private Brody. This “lead by example” philosophy demonstrates to our people that productivity can be strengthened by choosing the right space for the kind of work you need to accomplish. The end result is a workplace that truly supports our people and our business, with built in flexibility to accommodate future change. Want to see the space for yourself? We’d love to share it with you and your team…contact us to schedule a tour! Hi to all of you, hope all goes well. Looks beautiful. Hope you are enjoying your new home. Colonial Systems is proud to have been a part of creating this extraordinary working showroom for Red Thread. The entire design and project management team was very professional and a pleasure to work with. Boston fire code change allows furniture free of flame retardants. Red Thread helps Connecticut towns convert to LED streetlights.